If you like to reach your favorite off-road destination in a tuxedo, then check out the new Jeep Grand Cherokee Overland Summit AWD sport utility vehicle. 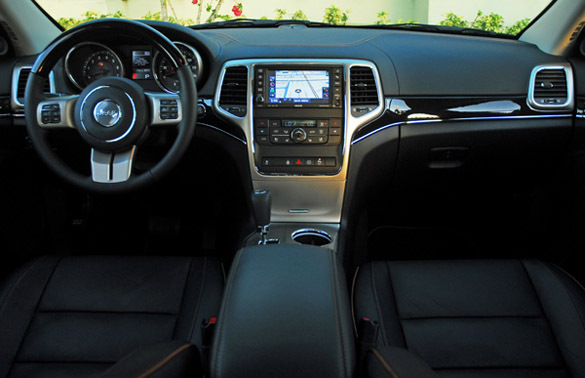 Besides Jeep’s fabled off-road prowess, this new Grand Cherokee is dressed to the nines outside and inside with the latest luxury, convenience, safety, connectivity and infotainment systems. My test 2013 Cherokee Overland Summit came fully loaded. New standard equipment includes front park assist, power folding outside heated/self-dimming mirrors and headlight washers. 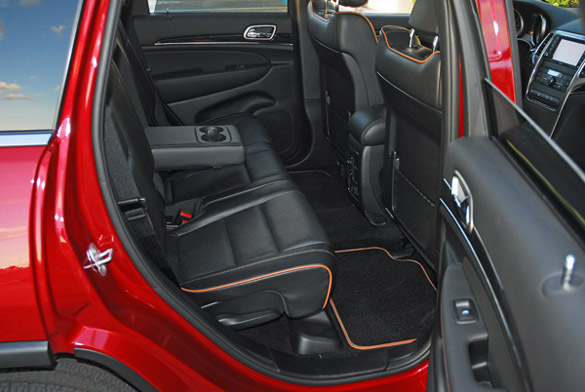 My Overland Summit came equipped with the new optional black colored Nappa leather seats with saddle accent stitching on the seats and the black Berber floor mats. The dashboard upper lid is also covered with leather featuring the single stitching saddle thread. The front bucket seats feature 8-way power adjustments with lumbar support, perforated inserts for heating and cooling functions. 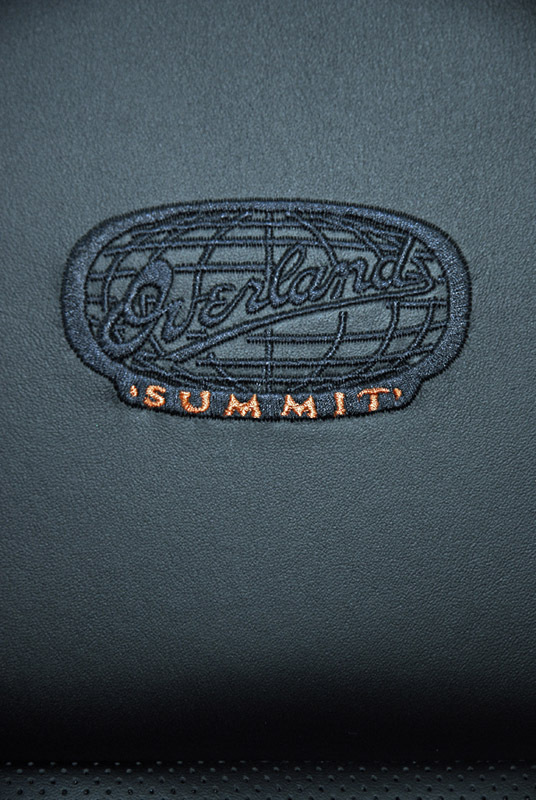 More about the sumptuous interior later as the exterior styling of the Overland Summit gets new bling. Sporting a unique front appearance with a fully chromed grille, Bi-Xenon headlamps, dual chromed tow hooks, chrome front skid plate and chrome fog lamp bezels. From the side are steeply raked windshield pillars, flared fenders, chrome pull-out door handles, a full-perimeter chrome strip around the greenhouse, a thick chrome strip running through both doors, black contrasted lower bodykit, and aluminum roof rack rails. Out the rear is a roof-mounted spoiler, wrap-around lamp clusters with a thick chrome strip giving it a solid appearance. The power liftgate features flipper glass for easy loading/unloading, a chrome-surround step bumper, and a single, 31/2 in. polished stainless steel exhaust tip. 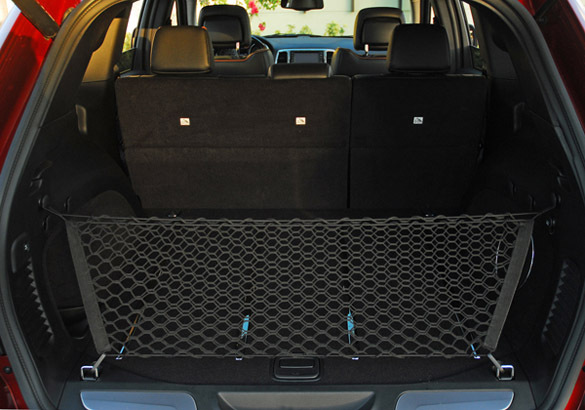 In the cargo area are four chrome slats and four chrome tie-downs plus a cargo net. On the inside the Overland Summit features unique Black Olive burl wood trim blended into the instrument panel. The distinctive polished trim wraps into the upper panels of both the front and rear doors surrounding passengers with the highest levels of craftsmanship. The wood trim is also used on the standard, leather-wrapped, power tilting/telescoping/heated/beefy steering wheel. The center stack, center console and air-vents are covered in chrome and satin aluminum giving the interior a further infusion of luxury. The stick shifter is of course, also covered in leather with the top part showing a black with white lettering Jeep signature. 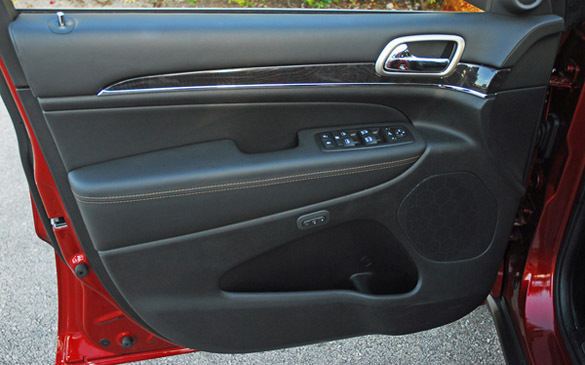 More interior refinements include heated second-row seats with air-vents out the end of the center console, two-driver memory settings for seats, steering wheel and side mirrors, rear pull-down center armrest with dual cupholders, electronic, dual-zone A/C system, power windows/door locks with front express up/down, dual-pane one-touch panoramic sunroof with power sunshade, electronic vehicle information center located between the rallye style gauges, Uconnect 730 N CD/DVD/MP3/HDD/NAV GPS navigation, 9-amplified speakers with subwoofer, Sirius satellite radio, 6.5 in. touch screen display, 506-watt amp, storage pockets in each door, a deep lighted glove box, grab handles above each door, dual map lights, dual lighted vanity mirrors, cargo area light, rain-sensing wipers/washers, rear wiper/washer, two-tiered storage box and padded armrest and thick cut-pile carpeting. Also standard on the Overland Summit is the Advanced Warning System and Adaptive Cruise Control group which consist of Adaptive Cruise Control, Forward Collision Warning, Blind Sport Monitoring and Rear Cross-path detection systems. Am I missing anything? 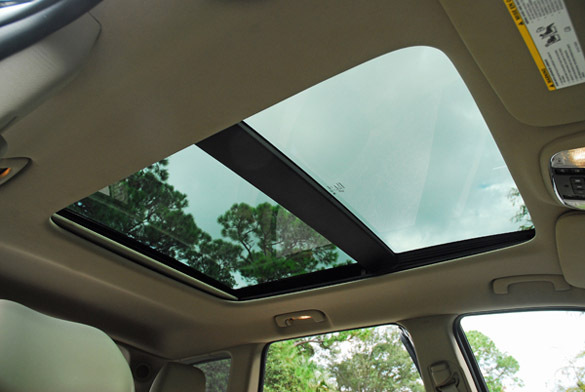 I don’t think that any other premium sport utility vehicle comes with more luxury, convenience, and new high-tech safety features. 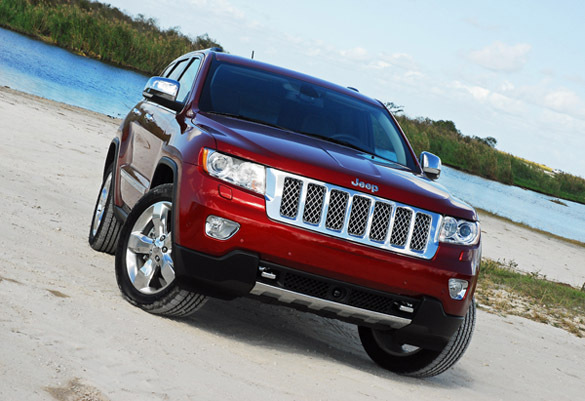 What really sets the new 2013 Jeep Grand Cherokee Overland Summit a part from any other SUV in the segment is Jeep’s fabled off-road ability. Let’s start with the power and torque to easily cruise on the highway and bust through the toughest off-road trails. You have a choice of the award-winning 3.6 liter VVT all-aluminum, DOHC Pentastar V6 engine that generates 290 hp at 6,400 rpm and 260 lb.ft. of torque at 4,800 rpm. Excellent fuel mileage specs of 16/city and 23mpg/highway. The 5.7 liter V8 engine with fuel-saver technology delivers 360 hp and 290 lb.ft. of torque at 4,250 rpm. 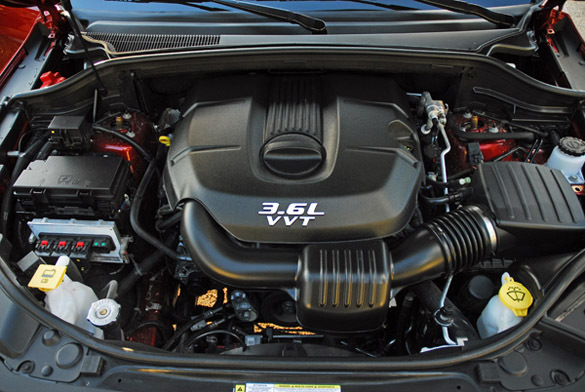 The VVT system on both engines delivers performance, towing capability and fuel efficiency. 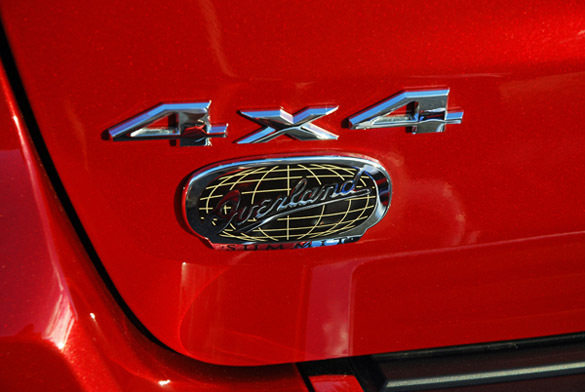 4X4 models achieve 13 mpg/city and 20mpg/highway. With the V8 engine fuel-saver technology seamlessly alternates between smooth high-fuel economy four-cylinder mode when less power is needed and V8 mode when more power is requested. This engine is mated to a six-speed automatic and the 3.6 liter V6 engine is mated to a smooth-shifting five-speed automatic. Both transmissions feature Autostick which allows you to hold each gear and make the changes, up or down, when you want it. The V6 engine offers a trailer-tow capability of up to 5,000 lbs. and up to 7,400 lbs. with the 5.7 liter V8 engine. That’s plenty of towing power from either engine. 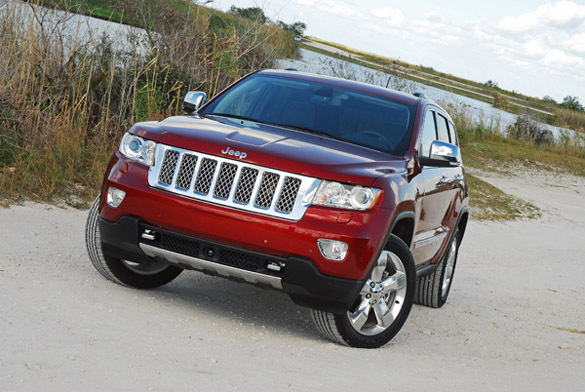 My test Grand Cherokee Overland Summit 4X4 had the V6 engine that provided me with plenty of power and towing capability for all of my needs. Besides the excellent power and torque ratings allowing you to easily cruise the highways and tough off-road trails with a trailer/boat or any type of active lifestyle accessories, the combination of Grand Cherokee’s Quadra-Lift air suspension system and the Jeep Selec-Terrain traction control system lets you choose the 4X4 setting for the optimum experience on all terrains-also giving you a ‘cloud-like’ air-ride on the road. My test Cherokee Overland Summit had both systems for the optimum off-road capability. Selec-Terrain electronically coordinates up to 12 different powertrain, braking and suspension systems, including throttle control, transmission shift, transfer case, traction control and electronic stability control (ESC). 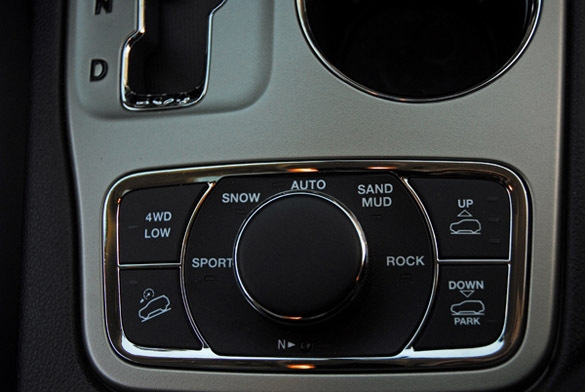 The Jeep Selec-Terrain’s control dial allows you to choose from five driving conditions in order to achieve the best 4X4 performance. Torque management to the drive wheels for maximum grip is achieved through the following settings: Sand/Mud-traction control and Quadra-Lift operates with sensitive response to wheel spin and torque is tuned for optimal performance; Sport-provides enhanced on-road ‘fun-to-drive capability; Auto-automatically adapts to any on-or-off-road situation; Snow-vehicle traction control adjusts for ultimate performance over snow-covered roads; Rock-Quadra-Lift air suspension system raises to maximum height (10.7 in.) and the transfer case, differentials and throttle coordinate to provide low-speed control. 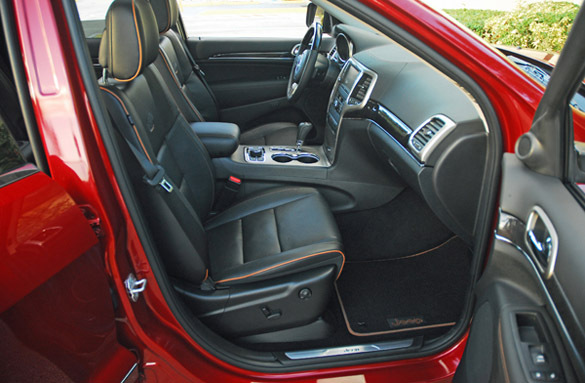 The Jeep Grand Cherokee also offers the Quadra Lift air suspension system, which features five height settings for optimum ride performance: Normal Ride Height (NRH): 8.1 in. of clearance offers improved fuel economy and improved aerodynamics during on-road driving; Off-road 1-Lifts the vehicle an additional 1.3 in. for added height in clearing obstacles (9.4 in. ); Off-road 2-Delivers legendary Jeep off-road capability and provides an additional 2.6 in. of height for 10.7 in. of ground clearance; Park Mode- Lowers the vehicle 1.5 in. from the NRH for easy ingress/egress and roof-rack loading, NRH and Park mode are driver selectable, giving you control over vehicle ride height; Aero Mode-Lowers the vehicle .6 in. from NRH. 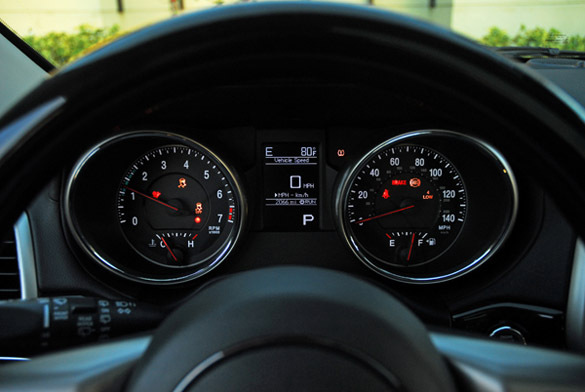 Aero mode is controlled by vehicle speed and adjusts for optimal performance and fuel economy. Quadra-Lift adds up to 4.1 in. of lift span that is supported by four-corner air springs that provide a cushioned, premium ride. Quadra-Lift operates automatically, or may be controlled manually via console controls. With the front airdam removed, and the available Quadra-Lift air suspension system, the Jeep Grand Cherokee Overland Summit 4X4 features a 34.3-degree approach angle, a 29.3-degree departure angle and a 23.1-degree Breakover angle. Front and rear independent suspension systems feature isolated front and rear suspension cradles. Variable rate rear springs deliver uncompromised on-road handling and comfort that complements the vehicle’s off-road prowess. The rear suspension allows the spare tire to be stored inside the vehicle. The Quadra Trac II two-speed transfer case actively manages torque and uses input from a variety of sensors in order to determine tire slip at the earliest possible moment and take corrective action. The system uses Throttle Anticipate to sense quick movement in the throttle from a stop and maximizes traction before slippage occurs. When tire slippage is detected, as much as 100% of available torque is instantly routed to the axle with the most traction. The standard electro-hydraulic power rack & pinion steering system in the V6 model gives excellent feel for the road, is smooth and reacts to your inputs immediately. It also increases fuel efficiency by 1mpg. The V8 model uses the standard hydraulic power rack & pinion system. 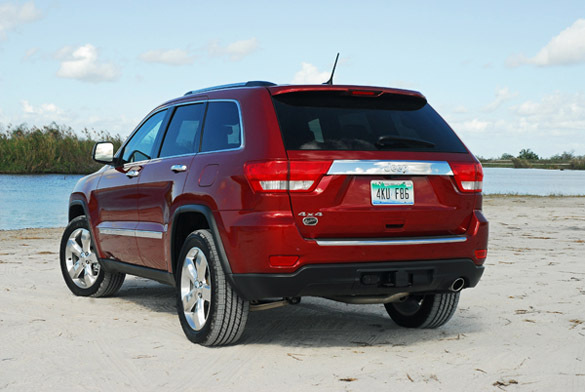 Quickly stopping the new Grand Cherokee Overland Summit down from speed are large, 4-wheel steel disc brakes. Up front are 12.9 in. vented discs clamped with dual-piston calipers. The rear features 12.6 in. solid discs clamped with single-piston calipers. Standard ABS, BA, Traction Control and ESC all work together to keep you in control when braking on slick pavement or when off-road. 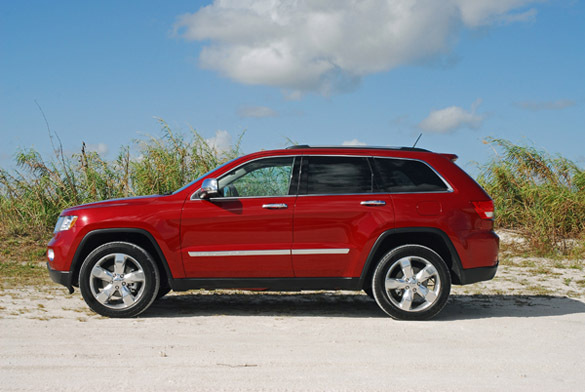 The new 2013 Jeep Grand Cherokee Overland Summit rides on huge 20X8 in. aluminum alloy wheels wrapped with Goodyear 265/50R20 in. Fortera HL all-season radial tires for a smooth, quiet ride with excellent traction. Standard features not mentioned above includes, self-dimming rearview mirror, reading lamps in the rear, and a cargo lamp in the back. Options not mentioned above in the Overland Summit automatic high-beam headlight control. Standard safety features includes hill descent control, daytime running lamps, advanced multi-stage front airbags, front seat-mounted airbags, side-curtain airbags, LATCH system for child seats, Parkview rear backup camera, ParkSense rear park assist system, trailer tow group, hill start assist, trailer sway damping, security alarm , 5-3-point safety belts with front pretensioners/load limiters, front crumple zone and steel beams in each door. 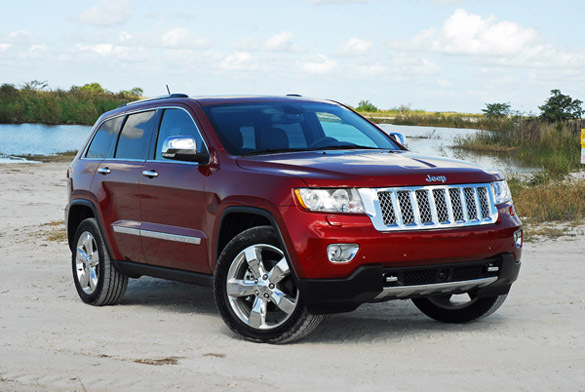 The new 2013 Jeep Grand Cherokee Summit Overland 4X4 gives the active lifestyle single, coupe or family exceptional luxury with Jeep’s Legendary Off-Road Capability! 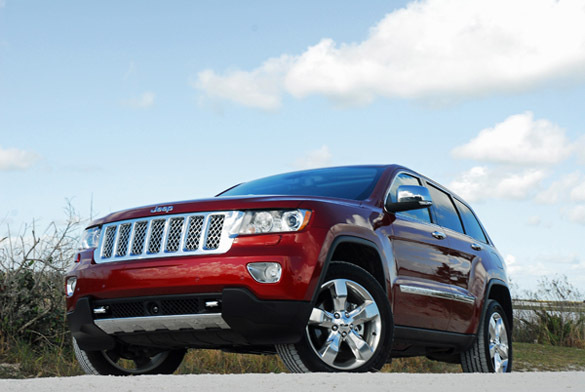 It can’t get any better than this new Jeep Grand Cherokee. Suspension: F-independent, SLA, air springs, gas-charged twin-tube coil over shocks, upper/lower control arms, stabilizer bar R-independent, multi-link setup with twin-tube gas-charged shocks, load leveling air springs for towing, aluminum lower control arms, independent upper links (tension & camber), separate toe link, stabilizer bar. Overall width: width at mirrors-84.8 in. Overall height: at roof rail-69.3 in. Maximum cargo volume: 68.7 cu.ft. Behind second-row seats: 35.1 cu.ft. Total passenger/cargo volume: 140.5 cu.ft.